Shanghai Media T e c h or SMT is one of China’s largest media and cultural conglomerates, with the most complete portfolio of media and related businesses. Shanghai Media Tech (SMT) evolved from the former Technical Center of Shanghai Radio and Television Bureau which was established in May 1987. SMT has the main business in the following seven fields: the broadcast, pre-production, post-production and transmitting broadcast of the radio and television programs, the operation and maintenance of the network, system integration and the application development of new media. Besides, SMT has also expanded to embrace some new business such as special effect cinematography, 3D/4K production, visual creation and New-Media product. In addition, SMT has established great partnership with global media giants such as BBC, NHK, ABC, KBS and Star TV in Hong Kong, meanwhile maintaining good cooperative relations with top institutions worldwide. Focus on NAB:THree Weeks to go - As of today we feature 30 companies and their approach at the NAB2019 Show. This list is continously updated. NAB2019 opens on 06April at the Las Vegas Convention Center. The link "NAB2019" will always show you the actual list of featured companies and events in alphabetical order. Using advanced algorithms which automatically analyze the image content and apply optimal corrections in real-time on a frame by frame basis. Until now “frame by frame” corrections were only possible by manually applying correction metadata to each frame which is then utilized during live playback; a non-real-time process, both time consuming and expensive. HDR Evie solves these needs – it delivers real time, frame by frame HDR to SDR conversion – in a single solution, and all automatically. The technology is both proprietary and patented, in close cooperation with Hochschule RheinMain University of Applied Sciences in Germany. Seeing is believing! You can personally evaluate the performance of HDR Evie™ image processing using an HDR camera capturing live content at the NAB show, booth N2827. SMT (Shanghai Media Tech) High Definition Broadcasting B2 Truck , has 11 standard workstations and 2 EVS operator positions, and these workstations can be flexibly adjusted according to the actual needs of the program. The system is equipped with 10 sets of complete SONY channels, which can meet the needs of various customers. It has 13 cameras, supports 7 channels of external signals,and supports high definition and standard signal format图. The truck uses SONY MVS6000 switchboard and SONY IXS-6700 video and audio matrix, which can better realize video and audio linkage (such as PHANTON function), and provide better convenience and guarantee for program production. 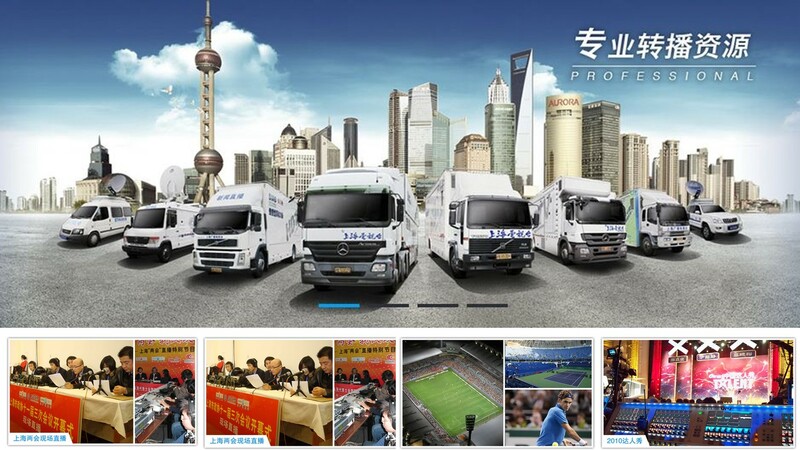 SMT (Shanghai Media Tech) High-definition B3 Outside Broadcasting truck with 12 standard operators work spaces and 4 EVS dedicated operators work spaces, which can be adjusted according to the actual needs. The truck is equipped with 10 video cameras and 22 external signal access. SMT (Shanghai Media Tech) 4K ultra-high-definition S3 Electronic Field Production System with 20 standard operators work spaces and 4 EVS dedicated operators work spaces, which can be adjusted according to the actual needs. The EFP is equipped with GV's brand-new IP core with more flexibility and convenience compared with traditional broadcasting system. The enhanced technical power EFP will meet diverse client with 24 4K video cameras, supporting more than 26 external signal access , and video format like UHD, HD, SD and etc. Its production and broadcasting process will support many HDR format as PQ, HLG, also HDR and SDR production at the same time. Reserved with 4K high-speed and 8K upgrade channel, the truck is fully prepared for future upgrades. The entire unit is equipped with 2 Cisco 40GBE switches framed with datacentre mode, supporting SPMTE 2022-6 with TR03 / 04 which can be upgraded to support SMPTE 2110 standard system in the future with the system capacity equivalent to 216*216 3G-SDI video matrix and 128 * 196 AES audio matrix (flexible adjustment by actual needs is available). The outfield production system is equipped with advanced equipment, reliable performance, and full-featured broadcast-level field-directed direct recording and broadcasting equipment, which can realize live broadcast and recording of the field, and create the most perfect sound for broadcasting, TV and social users. A BroaMan system, powered by Optocore, has been specified to send video and audio signals to and from the field, for use by journalists and technicians backstage. Local units include two BroaMan Repeat48 optical converters for video I/O, Route66 as fiber router, with TX and RX, and Optocore M8-OPT optical MADI switch for audio connectivity to the LAWO M56 mixing console via a GVG Sirius router. Italian production specialist NVP has selected a wide range of live production solutions from Grass Valley, a Belden Brand, for an upgrade to its outside broadcast (OB) fleet to support growing viewer demand for 4K UHD and HDR content. Installed in NVP’s OB4 and newly launched OB6 vehicles, this robust enhancement strengthens NVP’s position as a leader in live production in Europe. Despite Esports' growth and success in recent years, it doesn’t seem to be letting up as it keeps breaking streaming records while making wholesale changes to the sports and entertainment industries. The Esports infographic made by NJgames shows that the continued growth in popularity and media attention has seen Esports get global interest and is set to be rewarded with Olympics recognition. Ever since Paris were officially handed hosting rights for the 2024 Olympic games, the new sports that could be added to the roster have been one of the primary focus and Esports has been at the front of the queue for new events that the IOC (International Olympic Committee) plan on incorporating into the quadrennial event, with the organizers now in advanced discussions about including Esports into the event as a demonstration sport. The integrity, drama and dynamics of Luc Lafortune’s original lighting design are all preserved as the concept works beautifully and timelessly to support the show narrative. The House of Dancing Water (THODW) show is one of the most successful entertainment phenomena in the world – having clocked up over 3,500 performances, it has been enjoyed by over 3 million spectators who have been enthralled by this incredible work of aquatic art - the first original water-based theatre show ever launched in Asia. With an acclaimed performance in A Star is Born and recent Academy Award win for Best Original Song behind her, the multi-talented superstar is arguably today’s hottest performer. Renowned for her dynamic showmanship, showy costumes and staging, and powerhouse vocals, the pop superstar knows how to captivate an audience. Headlining her own Vegas show, Enigma, and an accompanying jazz and piano show, the two-year residency will cover 74 shows and possibly more. The theatrical show relates the story of Gaga and her Enigma character and embraces a message of healing and discovery. Lady Gaga herself calls the show "a celebration of all that is unique and different within us." Zac Brown Band has commenced the second leg of its “Down the Rabbit Hole Live” tour, the group’s fifth headlining concert tour, in support of its fifth studio album, “Welcome Home.” “Down the Rabbit Hole Live” launched last summer; the new 15-date leg kicked off March 1 in Tulsa, Oklahoma and wraps in Peoria on April 27. Zac Brown Band won’t be idle for long – the just announced “Owl Tour” begins in Indianapolis at the end of May and will play 36 dates in North America through October. An essential technical requirement for bringing Dancing on Ice to millions of viewers each week was to install permanent media fibre connectivity, for which ITV contacted NEP Connect (formerly SIS LIVE), the acknowledged leader in critical broadcast connectivity. NEP Connect’s Anylive® fibre network connects more than 150 sport, music and event venues across the UK and has proven its value across a vast number of live productions. The 2019 BRIT Awards were once again supported by Sennheiser, with its mics and IEMs delivering on the UK’s biggest live music awards show.The audio package was supplied - for the 22nd year - by Britannia Row Productions, and the ceremony was held in late-February at London’s O2 Arena in celebration of the best in British and international pop music. Winners on the night included Ariana Grande, Ed Sheeran, Drake, Little Mix and Nicki Minaj. Visitors to the EVS booth (#SL3816) will see demonstrations of new products and solutions, all tightly integrated with EVS’ core service platform, VIA, which is transforming the user experience. Witness how content creators are using XT and XS-VIA servers to deliver multi-format productions. Learn how a new software-defined ingest server is enabling more flexible studio operations. Discover the productivity benefits of virtualizing back-end resources. And in its AI Experience Room, learn how EVS is applying machine learning to deliver the future of live sports through innovations in VAR and unified production.